Sunbutter cookies. You can barely see the green flecks. Okay, so I decided to make some Sunbutter cookies and Sunbutter blossom cookies to take to a school event. I'm so glad I tried them out BEFORE taking them anywhere. Green inside? Really? I did notice that the plain Sunbutter cookies had little green flecks in them yesterday, but for some reason, I dismissed the flecks. Today I thought I'd taste a Sunbutter blossom cookie because I wanted to see if they were good enough to leave the house. I THINK it tasted okay, but when I looked at it, I was floored. 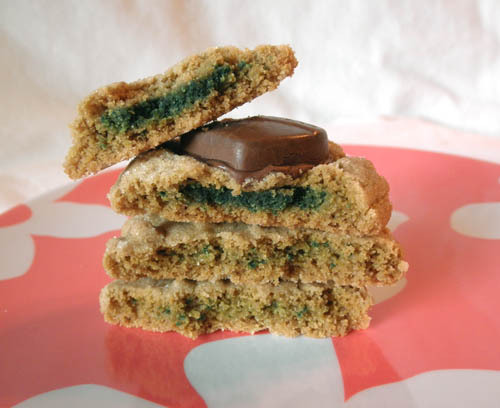 The very middle of each cookie had turned green. 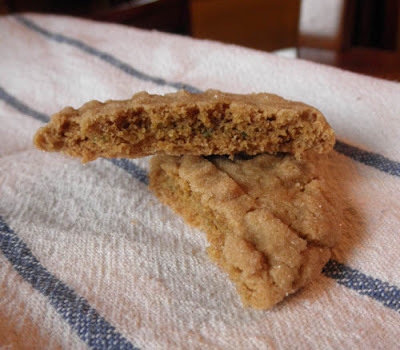 Of course I googled "sunbutter cookies green" immediately, and came up with a decent explanation (something about chloro-something-or-another in sunflower seeds), but that doesn't mean I'm going to eat them or serve them to others. Too weird. I'm mainly posting this recipe because it's an oddity, and the one website I looked at suggested I halve the baking soda to reduce the greening. So, give it a go if you'd like. I'm going to stick with peanut butter. In a large bowl, beat the butter, shortening, and Sunbutter until well blended. Add the sugars; beat until light and fluffy. Add the egg, milk, and vanilla, and beat well. Stir the flour, soda, and salt together. Gradually mix into the wet ingredients. Shape the dough into 1 ¼-inch balls. Roll in sugar. Place balls on a parchment-lined baking sheet, and bake in a preheated 375°F oven for 10 to 12 minutes. 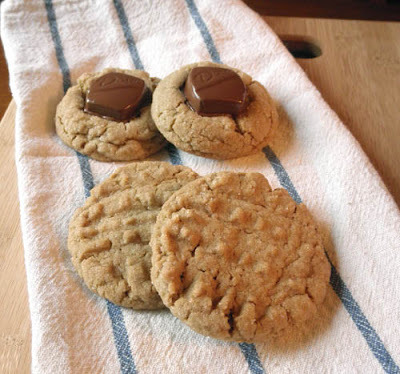 Remove from the oven and immediately place one chocolate Promise on each cookie. Then go back and press each Promise gently into the cookie. Transfer to a wire rack to cool completely. Sunbutter Cookies and Sunbutter Blossoms. The exterior looks fine. The green coloring would make this a good treat for Saint Patrick's Day, even if the greening was undesired.